CCSS.Math.Content.K.CC.B.4 - Understand the relationship between numbers and quantities; connect counting to cardinality. CCSS.Math.Content.K.CC.B.4.a - When counting objects, say the number names in the standard order, pairing each object with one and only one number name and each number name with one and only one object. 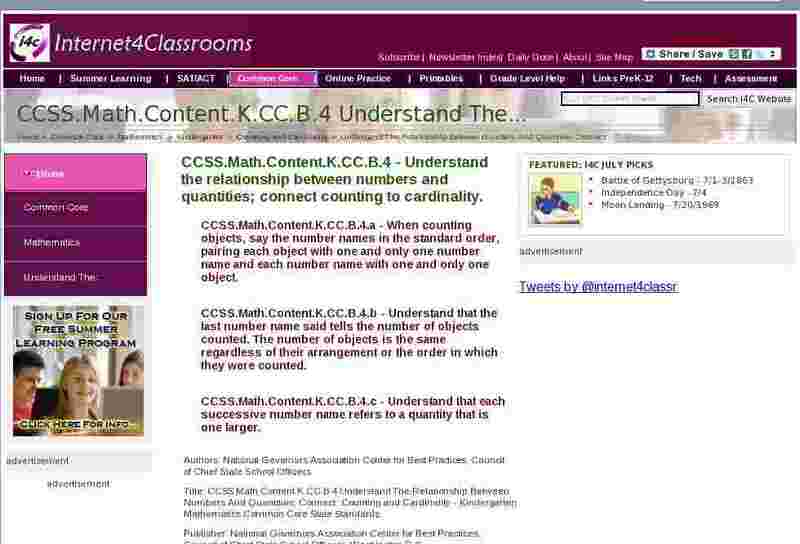 CCSS.Math.Content.K.CC.B.4.b - Understand that the last number name said tells the number of objects counted. The number of objects is the same regardless of their arrangement or the order in which they were counted. CCSS.Math.Content.K.CC.B.4.c - Understand that each successive number name refers to a quantity that is one larger.